Ok, so the weather can be a little unpredictable but there’s no denying that the UK is a truly fascinating place! Made up of England, Scotland, Wales and Northern Ireland, there’s certainly no shortage of cultures and traditions to experience. Not only is Great Britain steeped in history and famous for its medieval castles and ruins, but it boasts some of the best scenery in the world. Whether you’re contemplating a staycation or visiting from overseas, you will find stunning countryside, amazing coastlines and vibrant cities in abundance! When it comes to UK disabled holidays, there’s more choice than ever before from accessible city breaks to disabled cottage holidays as well as supported UK holidays for elderly people and those with learning disabilities. 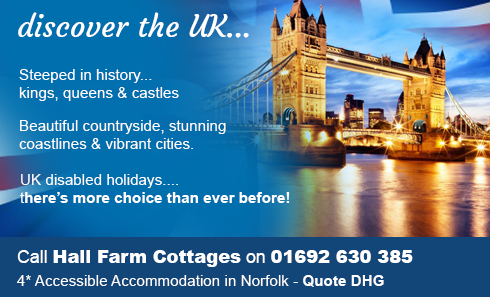 We feature a great range of UK accessible accommodation, mobility equipment hire companies, specialist holiday providers and much more. Carers also need some time out, so we’ve made sure to include UK respite breaks too. Visit the DHG Directory above and use our ‘Advance Search’ facility to assist you in finding accommodation and services that can meet your specific requirements within just a few clicks. We’ve got plenty of ideas for UK disabled holidays to share with you too, so if you’re not sure where to go in the UK, check out the ‘Popular Destination’ links to the left, and for further inspiration, scroll down to see this month’s UK amazing getaways and special offers. We’ve also created some mini guides, to help you discover the different types of UK accessible holidays and activities available to disabled people and you’ll find these in the 'Holidays and Ideas' section below. What are you waiting for…… go and enjoy the UK! King Arthur's Arms Save from £10 per night to 33% per short break with our special offers! Treworgans Farm Holidays Book Now! Check out this months amazing getaways! If you are looking for a holiday in The beautiful Isle of Wight which offers peace, tranquillity and beautiful views from all directions within a tastefully decorated, fully equipped, converted barn, then The Red Barn, Rookley is the place for you!The Red Barn is a large stone and brick barn and is one of a number of historic farm buildings, some of which date back to the 1500’s. It has a concrete parking area with space for 2-3 cars with level access to the building and to the outside decking with a shallow ramp down to a level lawned garden. There is complete accessibility throughout the spacious ground floor, which comprises the main living accommodation and three of the four bedrooms allowing excellent wheelchair access and manoeuvrability. The building is centrally heated throughout and fully insulated. Sail with the Jubilee Sailing Trust (JST), a registered charity that owns and operates Lord Nelson and Tenacious. These are the only two tall ships in the world designed and built to enable people of all physical abilities to sail side-by-side as equals. Tall ship sailing holidays with the JST provides everyone the thrill and adventure of life at sea and you can be involved in almost every activity on board. Take the helm, set the sails and keep watch, all regardless of your physical ability and previous sailing knowledge.